The importance of using the right pillow is undebatable, especially if you are a side sleeper. This is going to help you sleep comfortably, and more importantly, will reduce the possibility of suffering from an aching body the morning after. With this, if you read any side sleeper guide, you will notice that a lot of experts are recommending the use of the right pillow. Which one should you pick? If you have no idea which one is the best, keep on reading and know more about Coop Home Goods Pillow to decide if it is going to be an option that will be worth your money. Coop Home Goods has just released a 2.0 version of the pillow with new material. Today, CoopHomeGood will evaluate both products for you to make more choices. The Coop Home Goods Eden Pillow has fill that’s made of cross-cut gel memory foam and poly fibers. 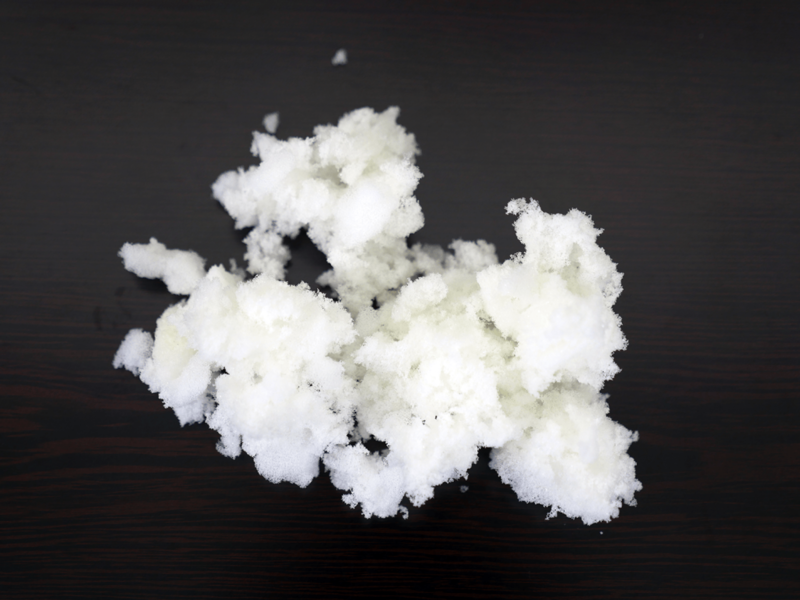 The poly fibers help keep the gel memory foam from clumping. Cross-cut vs. Shredded Foam: What’s the Difference? | A cross-cut foam is generally a larger piece of foam that’s been cut along the length of the foam to create squares and rectangles instead of shreds. Shredded foams may fall flat more quickly than a cross-cut foam since the cross-cut can retain more of its shape and structure for better support. The foam fill is CertiPUR-US, which means that it has been inspected and guaranteed not to contain any dangerous substances like mercury, formaldehyde, leads and heavy metals, ozone depleters, or other toxic materials. In addition, the Eden pillow is hypoallergenic and dust mite-resistant, which can be great for allergy sufferers. The adjustable nature of this pillow allows sleepers of all different positions to find the loft that works for them. In many cases, low loft pillows may work best for stomach sleepers, while back or side sleepers typically prefer medium or high loft. The cover of the Eden pillow by Coop Home Goods is extremely soft and breathable. It uses a blend of bamboo (40%) and polyester (60%) to help sleepers stay cool at night. The cover is also removable with a zipper closure so individuals can machine wash and dry it. The cover is white with gray stitching in a geometric pattern and has a quilted feel to it. Beneath the cover is another pillow casing that contains the actual foam. This makes it easy to wash and dry the cover without having pillow fill scatter. This inner casing is made of interlock fabric, which contains the fill without being heavy or thick. There is also a 2” mesh gusset around the side of the pillow that promotes airflow for better pillow cooling and increased support. Along the seam of the gusset is the hidden zipper that opens the pillow. The Eden pillow is soft, but supportive and comfortable. The gel memory foam provided a deep amount of hug, sinkage and compression. For sleepers who prefer to float on top of pillows, this may not be the best option. In addition, this pillow has slightly slower response time than what you would get with a cotton, latex, or polyester pillow. This delay in the response is due to the memory foam, but because it’s shredded, it will likely be faster than a traditional solid core memory foam pillow. Regarding the adjustments, I made quite a few. When sleeping on my stomach, I had to remove a considerable amount of the fill in order for it to be the correct loft. Once adjusted, though, it was breathable and supportive all through the night. On the contrary, when sleeping on my back and side, I needed more fill, especially at the base of my neck. For sleepers who suffer from back or neck pain, adjusting the loft can be a great way to target those ‘problem areas’. For me, once I adjusted the loft, this pillow was supportive and surprisingly cool for a memory foam pillow. Coop Home Goods Eden Pillow – Loft Comparison (Left: stomach sleeper – Right: back or side sleeper) Note: Both versions can be made with the foam provided in the original pillow purchase. The Coop Home Goods Eden Pillow comes with a high amount of loft. For most sleepers, this would be sufficient for proper support, but for sleepers looking for ulta-high loft, they also sell 1/2 lb. bags of extra fill for greater loft or density. Shredded Visco Elastic Memory Foam: This model is not just made from plain and simple memory foam, but one that is shredded. This is asserted to be better regarding being able to provide the personalized fit. Its shape will be contoured based on the body of the user, which is why it can provide comfort that is tailor-fitted to individual needs. Hypoallergenic: One more feature that is worth highlighting in this product is its ability to resist the most common allergens, including those that can be caused by dust and mites. For sure, you will not end up sneezing in the middle of the night, and hence, sleep distractions can be eliminated. 30-day Satisfaction Guarantee: You will enjoy one month of risk-free trial. Within such period, if you are dissatisfied in any way, just inform the manufacturer. Return the product and they will issue an unconditional refund. 5-Year Warranty: The manufacturer is confident about the quality of their product, which is exactly the reason why they are offering a warranty that lasts for five years. 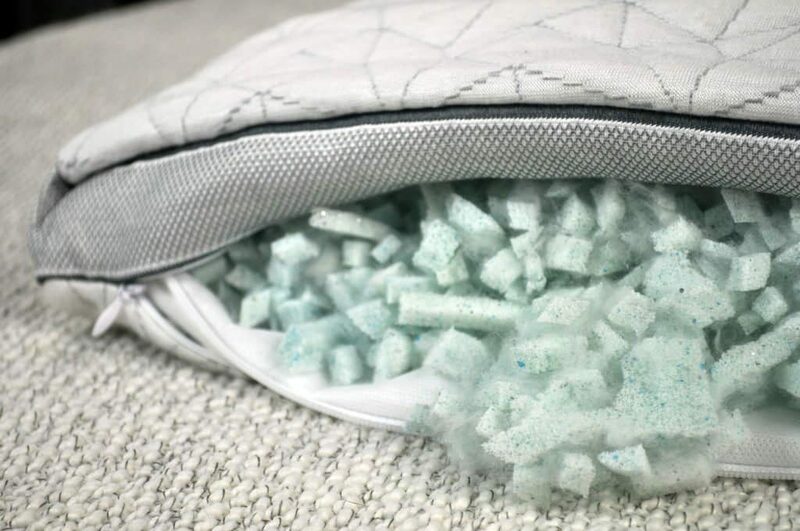 High-Quality Foam: One thing that has been highlighted in the best pillows for side sleepers reviews is its premium quality foam. It is long lasting, and more importantly, its firmness can be adjusted based on individual preferences or requirements. Affordable Price: While this may not necessarily be the cheapest option that is available in the market, one thing that makes it impressive is its reasonable price, especially considering the benefits that it can deliver. Retains its Shape: The plushness of the foam will keep throughout the time that you are sleeping while also being able to provide customized comfort. Has a Strong Odor: This is one thing that has been complained about by many users. There is a strong chemical smell once it is opened. According to the manufacturer, however, this is going to naturally disappear after a couple of days. Not as Supportive: For those who prefer firmer pillow with strong support, this may not be the best choice. Because it has shredded memory foam, it can be pushy. 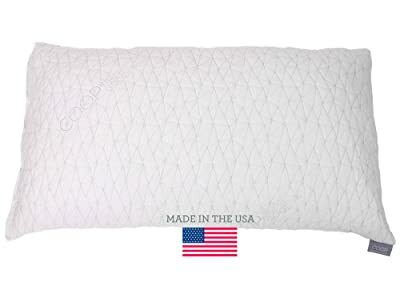 In sum, if you read any side sleeper guide, you will see that Coop Home Goods Shredded Memory Foam Pillow with bamboo cover is highly recommended. With its wide array of features and use of premium materials, it is sure to be an excellent way to improve your quality of sleep, minimizing pain and discomfort that can result from sleeping on your side. Before there was the Eden, Coop Home Goods offered only one memory foam pillow. Here is the original Coop Home Goods Memory Foam Pillow review. These two pillows are actually quite similar, but the changes have made for significantly better cooling. So what’s new? 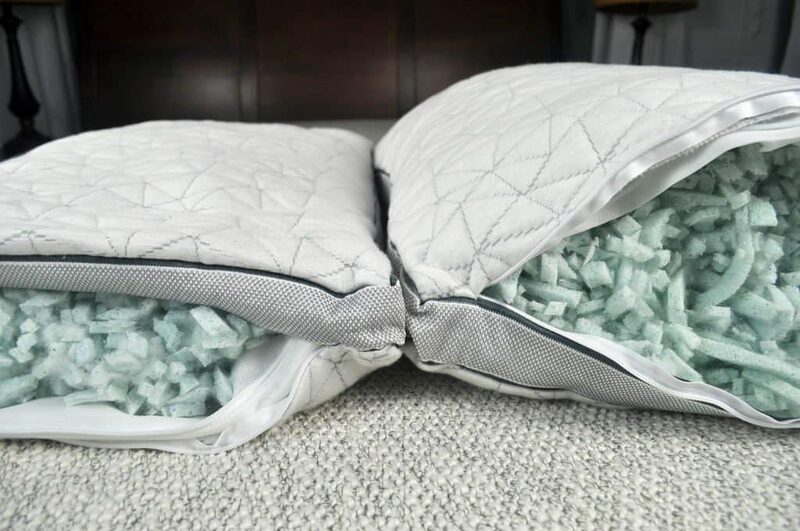 The original Coop Home Goods memory foam pillow was made from shredded memory foam, but otherwise had the same cover and interior pillow casing. The new Coop Home Goods Eden pillow uses a cross-cut memory foam and also includes a 2” mesh gusset for increased airflow, circulation, and support. 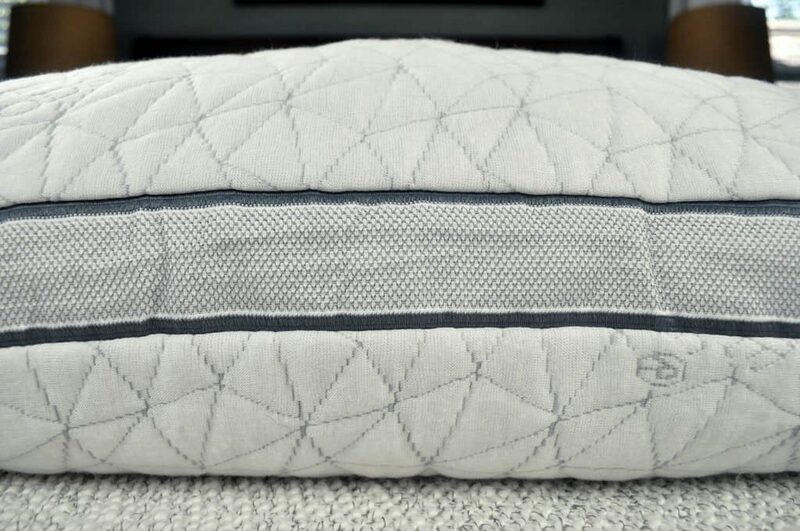 If you’re on a tight budget and not overly concerned with cooling, the standard Coop Home Goods memory foam pillow may be right for you. For sleepers looking for better cooling and support, the Eden pillow would be the better choice. Should I buy the Coop Home Goods Eden Pillow? Sleepers looking for a budget-friendly, adjustable foam pillow who are also concerned with cooling may be a good fit for the Eden pillow. To fall in love with the Eden pillow, one must love memory foam, but the softness, rounded hug, and airiness of this pillow are hard to beat for a pillow of this style. Want an adjustable foam pillow – Sleepers who are struggling to find the perfect amount of loft may benefit from an adjustable pillow. The Eden pillow allows for easy adjustments by simply unzipping the cover to add or remove as much fill as necessary. Coop Home Goods also sells additional packs of foam for extra loft (if needed). Want a memory foam pillow – The Eden pillow is a traditional memory foam in the sense that it is viscoelastic and designed to hug and contour the head and neck with a slower response time. The gel memory foam doesn’t change many of the properties of memory foam, in my opinion, but it is much cooler. Want good cooling – There are quite a few design factors that enhance the cooling on the Eden Pillow. The bamboo and polyester cover is soft and breathable. The 2” mesh gusset on the sides also allows for more air circulation. And the gel cross-cut memory foam fill helps resist heat retention during sleep. Want a hypoallergenic solution – The Eden pillow is hypoallergenic and resistant to dust mites. The Coop Home Goods Eden Pillow is a bit of a “2.0” version to their original memory foam pillow. 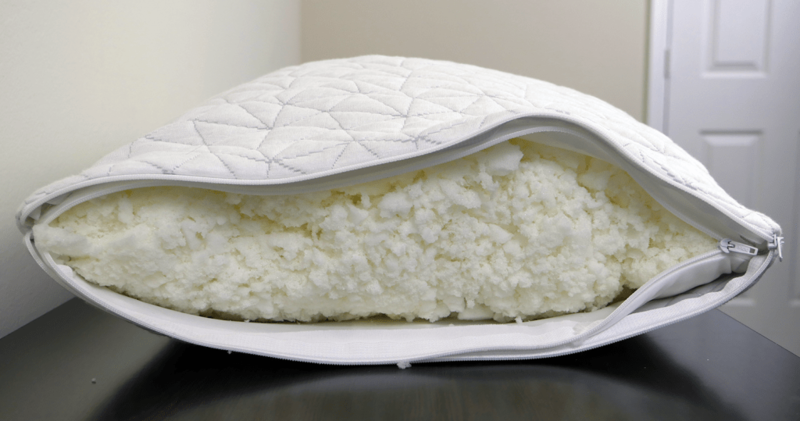 The incorporation of the cross-cut gel memory foam and 2″ gusset around the sides helps this pillow have greater air circulation and overall cooling. Memory foam, in general, can be a warm material. Making these changes to their original pillow provides all the feel that sleepers love about memory foam, but now with greater cooling.